According to the U.S. Department of Agriculture, more than 45 million turkeys — one-sixth of all turkeys sold annually — are eaten at Thanksgiving. These numbers are staggering. And, thankfully, completely unnecessary. This Thanksgiving, replace turkey or ham dishes with these plant-based versions filled with all the flavors you’re used to, minus the cruelty. Pair these plant-based centerpieces with all of traditional Thanksgiving favorites like roasted vegetables, mashed potatoes, stuffing, or green bean casserole. From turk’ys to roasts to hams, these vegan meat alternatives will sure to please you, your family, and your guests. Where Do You Buy Vegan Meat Alternatives? 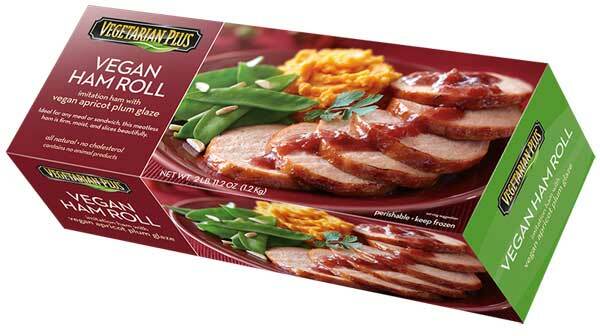 Back when I went vegan more than twelve years ago, there weren’t many pre-made options for vegans at Thanksgiving. I’m pretty sure that there was only one and it wasn’t straightforward to find in stores. These days vegans have plenty of option, and they are more readily available than ever. 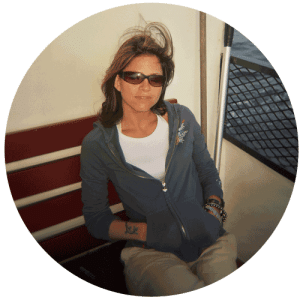 Most health food and natural food stores, and many locally owned co-ops stock meat-less options, as do some of the large box stores like Target and Walmart. Look for vegan meat alternatives in a refrigerated section of markets, often located in produce departments or weirdly near dairy cases. Also, check the freezer sections, sometimes roasts are sold frozen too. If your favorite local store doesn’t stock vegan meat alternatives, ask a manager to start carrying it. Many grocers are happy to special-order something just for you. Tofurky is the classic meatless holiday feast that’s been around since 1995. 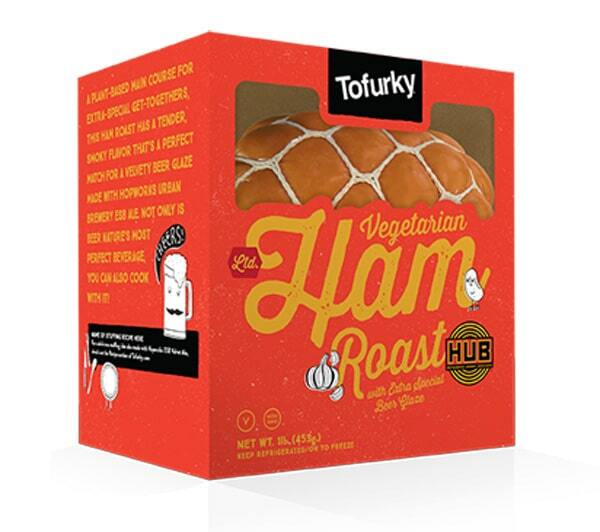 The Tofurky Roasts are a savory blend of wheat and organic tofu. Each one is enough to feed about five people and weighs one pound ten ounces. Get more information, including a product locator, at www.tofurky.com. New last year is the Ham Roast with Amber Ale Glaze. According to Tofurky, this roast has a tender, smoky flavor that is complimented with a sweet, tangy glaze. I’ve read reviews, and they’re pretty good. Get more information, including a nifty product locator, on www.tofurky.com. Do you have a large crowd of hungry vegans to feed? 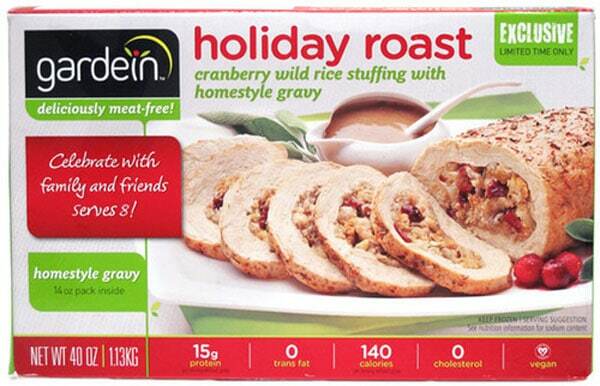 Gardein Holiday Roast is a great option. This savory roast has a firm texture and comes filled with a cranberry wild rice stuffing. Plus, gravy comes with it. It weighs over two pounds and can feed up to eight people. Get more information on www.gardein.com. Is your holiday meal going to be a party of one or two? 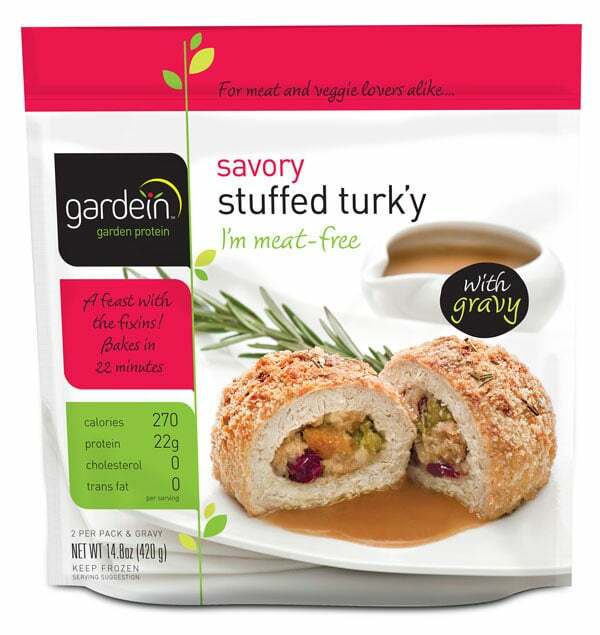 Gardein makes Savory Stuffed Turk’y with Gravy, an ideal choice for small or individual portions. Each package contains two individual stuffed turkey-style rolls stuffed with cranberry stuffing and two servings of gravy. 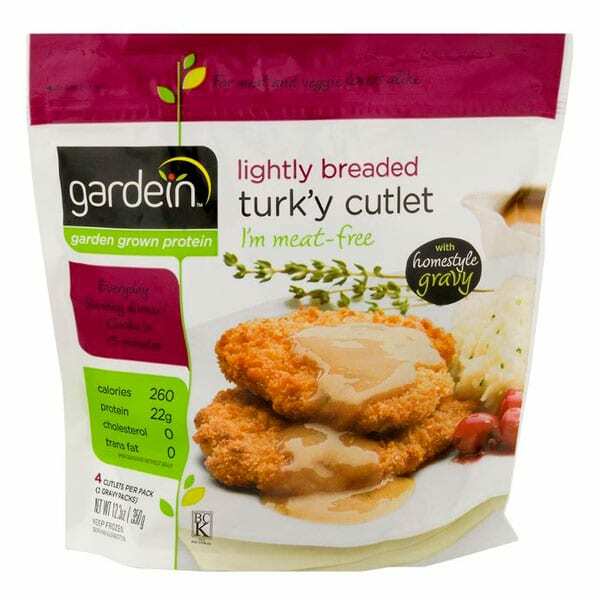 In addition to their other holiday offerings, Gardein makes meatless Breaded Turk’y Cutlets which are also an ideal choice for small or individual portions. Each package contains two individual breaded turkey-style cutlets and two servings of gravy. 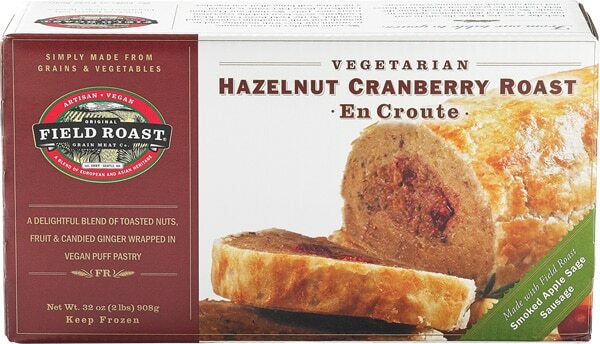 Get ready to impress guests with the Hazelnut Cranberry Roast en Croute. It’s a rich, savory hazelnut-infused grain meat stuffed with Field Roast sausages, cranberries, crystallized ginger, and apples then wrapped lovingly in crisp puff pastry. It’s a gorgeous two-pound roast that can feed up to eight people. Get more information on www.fieldroast.com. 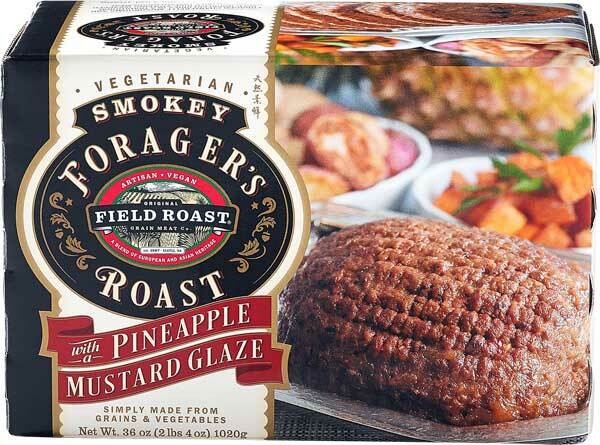 Field Roast describes the Smokey Forager’s Roast with Pineapple Mustard Glaze as an elegant centerpiece and they’re right, it’s lovely. This roast is savory, smoked grain meat seasoned with a unique blend of spices. It’s stuffed with foraged chanterelle mushrooms, and wild huckleberries gathered from deep within the forest glens of the Pacific Northwest. It’s two pounds of wow and feeds up to eight people. 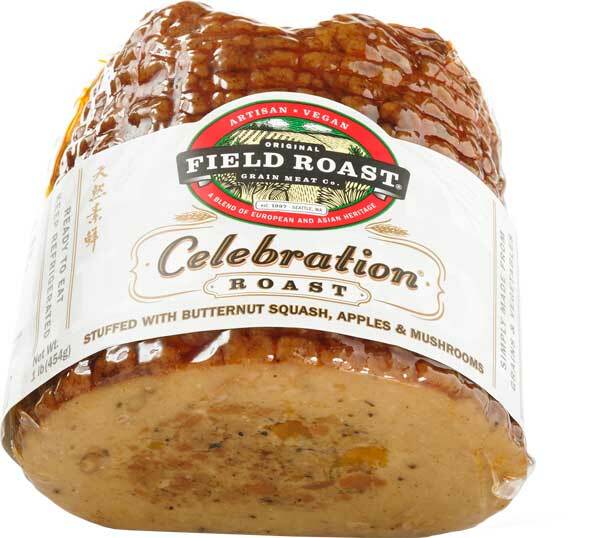 Field Roast’s Celebration Roast has been a fan favorite for over a decade. It’s a savory roast seasoned with rubbed sage and garlic, then stuffed with a traditional bread stuffing made with cranberries and butternut squash. The roast comes in two sizes, one or two pounds. The one-pound size can feed up to five people, while the two-pound roast can feed up to eight. If it’s a shocking, realistic-looking vegan turkey, drumsticks and all, then the Vegetarian Plus Whole Vegan Turkey is for you. 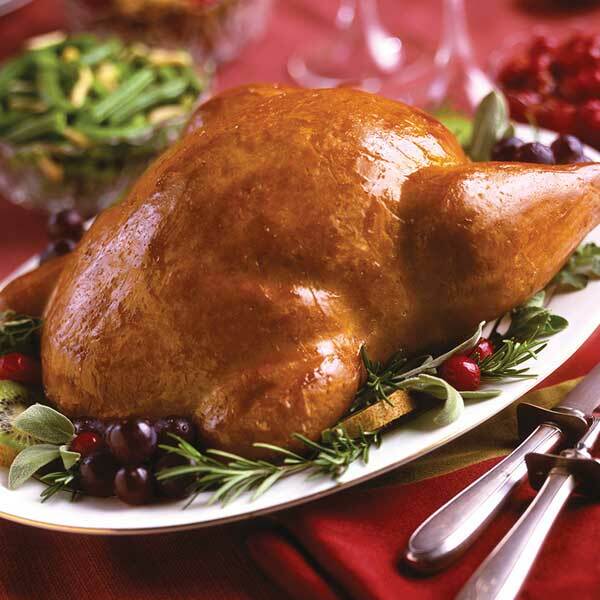 The four-pound vegan turkey is made from wheat and non-GMO soy, and it’s firm and easy to slice. It comes with one-pound of prepared stuffing and mushroom gravy. This centerpiece feeds up to twenty-six hungry guests. Get more information at www.vegetarian-plus.com. Is there any vegan thing that Trader Joe’s doesn’t offer? 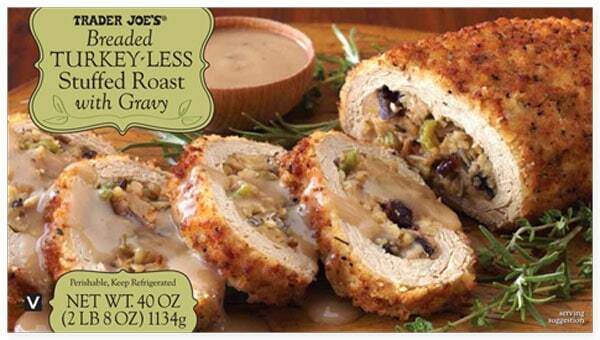 The Trader Joe’s Breaded Turkey-less Stuffed Roast with Gravy is made with ancient grain flour, stuffed with cranberries and wild rice stuffing, and served with a savory gravy. The one-pound roast can feed up to six hungry guests. Get more information on www.traderjoes.com. Photo credits: Feature photo via Tofurky. All product images via manufacturers.